Margaret, who stayed at Coastal Cottage in Maravilla said: "Great house! Spacious and comfortable! King-size beds and large showers were great! Plenty of room for all 9 of us! The walk to the beach was a little longer than I expected, but not more than 10 minutes. The pool is half that distance. Nice atmosphere in the subdivision. We would definitely consider staying there again in the future." Stephanie, who stayed in Maravilla at Coastal Cottage had this to say: "We really enjoyed our stay. The house was very nice and bigger than expected. The location was great and the beach was beautiful! We will defiantly be coming back!!" Nicole, who stayed at Gulfside Getaway in Woodland Shores, had this to say: "This was a fantastic place to stay, and my family will definitely look into staying here again next year. I highly recommend it. Coastline Condos was very easy to work with and the check-in and check-out couldnt have been easier." Valentina, who stayed at Majestic Sun 1103B, had this to say: "Steps from the beach, what else could you ask for. We had plenty of room for 2 couples. Wonderful stay"
Rachel, who stayed at Majestic Sun 1103B said, "We really enjoyed our stay here. 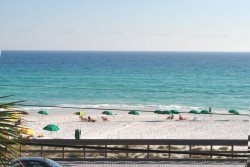 It is a perfect location right on the beach with a few restaurants in walking distance." Janet, who stayed at Grand Caribbean West, had this to say: "This quaint condo has everything you need to enjoy a trip to the beach. The hallway bunk beds are amazing. My daughter liked having her own space--and I liked using the bottom bunk for afternoon naps! The location is ideal. You have plenty of easy access parking, and the walk to the beach literally takes less than 5 minutes. I liked the corner spot because it gives you a great view and an added sense of privacy. The price per night was a good value for the money in my opinion." Jess, who stayed at Summerspell 109 had this to say: "We had a wonderful time during our stay. We loved the location, and the kiddos especially loved the close proximity to the pool! Everything was very tidy and just as we expected. We would definitely stay there again, if its available when we return." Rebecca, who stayed at Maravilla 1204, had this to say: "Overall it was a great experience and wed book through you guys again. Shoutout to Curtis for being sooooo helpful and shipping us an item that we left behind. Greatly appreciated!" Crystal, who stayed at Vacation Villa in Woodland Shores, had this to say: "My family and I had a wonderful stay at the villa 21 at Woodland Shores. This townhouse is in a great location, short from the beach with an at home feel. The swimming pool is clean and you have access right outside your door. The locals are very nice and make you feel like you belong. I recommend bringing your family as this was a very comfortable home with all the amenities!" Sam, who stayed at Grand Caribbean West 315 had this to say: "Such a great spot for MDW (Memorial Day Wknd)! The place was in the perfect location within minutes of a beautiful beach. The condo was extremely clean and the check-in process was seamless." Tara, who stayed at Maravilla 2305, had this to say: "It was a great family-friendly and pet-friendly vacation spot!! Love it." Jerry, who stayed at Majestic Sun 1103B said: "Very clean, awesome view, we enjoyed our stay. Beach is across the street but only a few yards walk." Frankie, who stayed at Grand Caribbean West 315, had this to say: "We enjoyed our stay and would definitely rent again!" Phyllis who stayed at Maravilla 1111 had this to say of her experience: "Loved it - will be back!!! We had a great time in this comfortable first floor condo. We were close to the pool and a short walk across the street to the ocean. We loved having our own chair and umbrella service. The only thing that would have made it better was if it had ocean views - but wonderful for the price. We plan to come back again!" Ana, who stayed at Maravilla 1114, said: "Beautiful condo with a perfect location!! Only steps away from the beach, pool, and a short car/bike ride to restaurants and shops. The place was clean and tidy. The beds were very comfortable and the kitchen had all the appliances we needed. Our host left very detailed explanations of how to access the complex and other amenities. We look forward to staying here again some day!" Amy, who stayed at Grand Caribbean West 314 said: "Very convenient to the beach and within walking distance to great restaurants. Its a perfect place for a small family on a budget." Lawrence who stayed at Maravilla 2212 had this to say: "Nice pool and close to the Gulf. Plenty of elevators and carts. BEAUTIFUL beach. DVD player was a nice plus. Great book collection." Jennifer, who stayed at Maravilla 4303 said: "The condo was in a very convenient location and while there were lots of other families around, it was never noisy (we have a 2-year-old, so thats important with nap time, etc.!) The hosts sent very detailed instructions in advance of our trip and were easy to get in touch with, which we appreciated. Overall, we had an excellent stay and hope to come back again!"